Having friends in town for a week means no time for blogging, reading or writing (except for that one scheduled post that I totally forgot about until someone commented on it). I hope to catch up this week! 1st things 1st, back to meal planning that doesn't involved eating out at all our favorite local restaurants. Before our friends arrived, this month's FNM arrived in my mailbox. It sat neglected for too long, until I flipped thought it today and found the best spread I've ever seen in a food magazine! I walked over to my husband and told him, "This is what we're having for dinner this week". We agreed that this is a pretty much perfect week of meals for us. Lots of international flavors, lots of chicken (I don't eat beef or pork) and they can all go into the crock pot and be ready for us when we get home from work/school. PERFECT! We're trying 5 new recipes this week, if any of them turn out well, maybe I'll share the details. Friday: Dinner with friends at a gender reveal party (not mine) that you will certainly see more about next week. 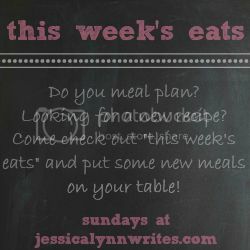 What are you eating this week? Link up with Jessica Lynn. That nacho soup does look yummy!! Ok I am definitely going to make the chicken tikka masala this week! So glad you shared links to these recipes!